Just like a family, with a little love and attention, an old weathered piece of wood can turn into something beautiful! I became the happy owner of a big 'ole pile of junk wood last fall. A lot of it was old fence boards, but there was also a bunch of pallet wood which became a sign. 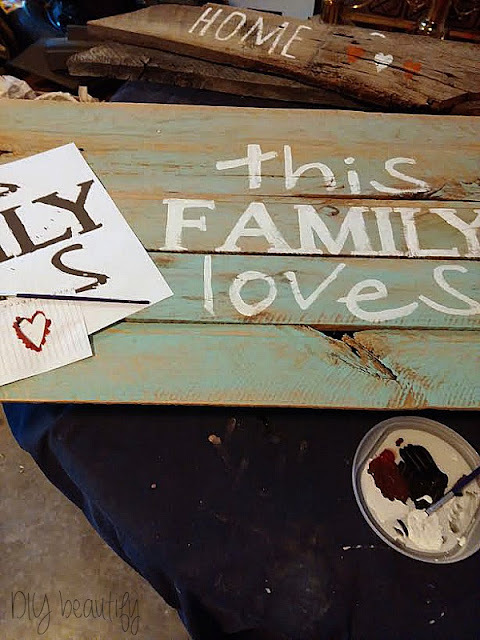 Painting a meaningful saying on a piece of rustic wood and hanging it on the wall not only adds warmth and character to a room, it adds personality! And it's definitely a budget-friendly project! I love the ability to customize a sign, because I can put the exact phrase I want to on the wood and make it sized to fit. 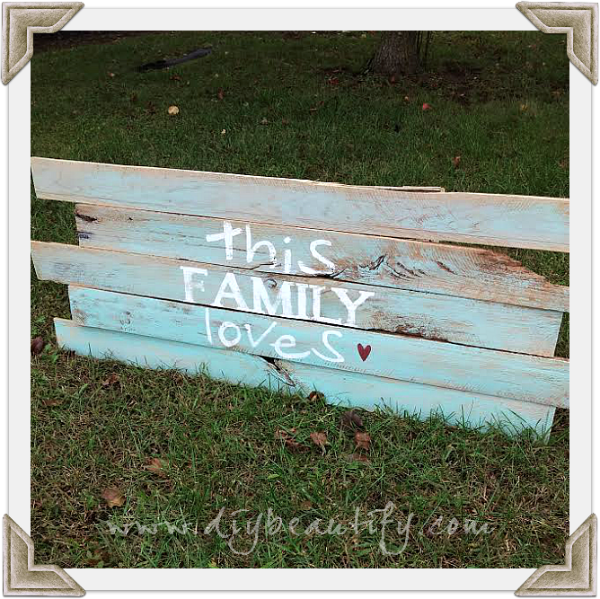 Mr DIY pieced this sign together from sanded pallet boards, offsetting each board slightly to add interest to the piece. *Denotes affiliate links. For my complete Disclosure Policy, click here. Tip: when working with pallet wood, it's much easier to sand the boards individually before attaching them together for your project! Once all the pieces were nailed together into a solid piece, I dry-brushed it with aqua chalk paint* (Americana Decor 'Refreshing'). I didn't want to completely cover the wood, but to keep it aged. After the paint dried, I went over it with my palm sander* to further knock back the brightness of the paint and add additional distressing. 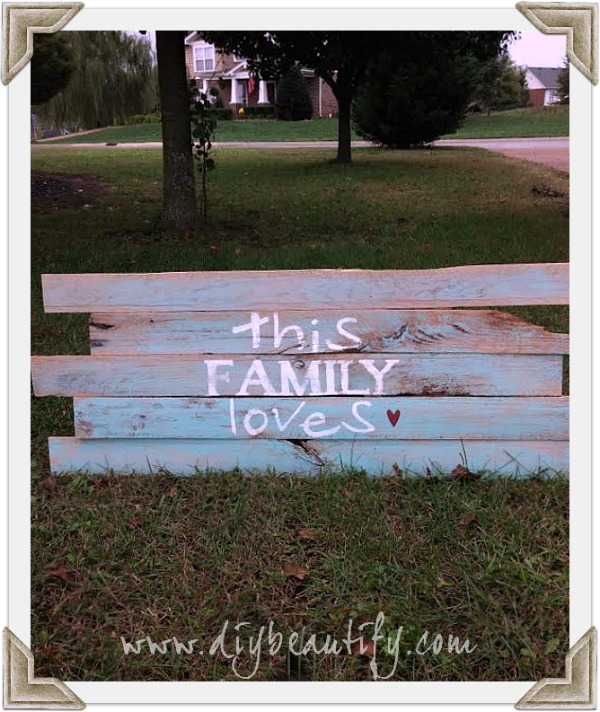 After wiping off the sanding dust, I painted on my phrase, 'this Family loves' that I created. This sign was created after my Cricut* machine died on me (it was over 10 years old) and before I purchased my Silhouette*, so I had to come up with another way to create the letters...and get them onto the sign. If you have a die-cut machine, it's definitely the simplest way to cut out your phrase to your desired size and add it to the wood. I love using PicMonkey* for creating phrases and I typed my phrase, 'this Family loves', using my own fonts in PicMonkey, then saved it to my computer, opened it in Office, dragged the corners to make it bigger and printed it out onto multiple pages. The transfer method works best if you have a steady hand, and especially if the letters for your sign are curved. You can see step by step details of the transfer method on this Love sign that I made. You're rubbing chalk on the back of a printed copy of the phrase and then tracing over it with a pen. The chalk transfers on to your wood and gives you an outline that you can then fill in with paint. TIP: use dark chalk when transferring to a light piece and light chalk when transferring to a darker piece; I would consider bare wood to be light, therefore I'd use white chalk. The third method to getting your words onto wood is to create a stencil by hand cutting all the letters from paper, taping it and painting in onto your piece, just like I added the word 'COFFEE' to this painted hutch. It's the best method if most of your letters are straight lines. It takes a little bit of time, and a sharp craft knife*, but once you're done, the painting is easy and goes quick! Sometimes, I find that a combination of both is the way to go, and that is how I chose to approach this sign. Letters that had straight lines were easier to cut. Those curvy lines were easier to trace onto the pallet wood, and then paint by hand. Just select the method that you're most comfortable with and remember to go light on the paint. Once the paint is completely dry, you can lightly sand it to distress before waxing. I'm really happy with my handmade sign. The little heart adds a lively pop of color to the piece, and red and aqua is a delightful combination! If you want to try your hand at making the sign shown here, feel free to grab the free printable below (for personal use only). You can insert it into a frame, or use it as a template to paint your own sign like I did! If you do choose to make the sign, I'd love to see your finished piece! What's your favorite method to creating signs with phrases? 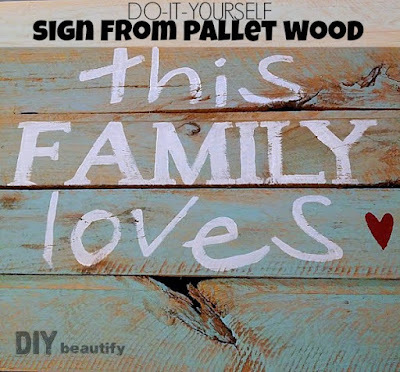 Have you made a pallet sign yet, or a sign from another piece of discarded wood? As always, I'd love to hear from you!! Your comments truly do make my day and motivate me to keep creating fabulous content! I love pallet projects. I especially like the sweet saying and delicate colors against the rough surface of the wood. 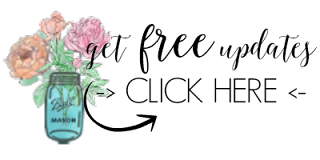 This is my first time to your blog and it's super cute over here. I found you at Project Challenge link party. Thanks for sharing. Holly, thank you so much for your kind words! I'm so happy to have you visit!